Keith McMillen Instruments (KMI) has appointed MSL Professional as its new distributor for the UK and Ireland. KMI is a creator of hardware and software technologies that allow musicians, DJs and VJs to interface with computers in exciting new ways. 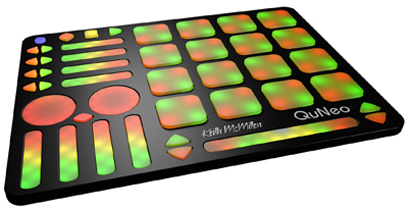 KMI products include the popular QuNeo 3D multi-touch pad controller (pictured below) designed for use with music and DJ software, the QuNeo Rogue wireless accessory for QuNeo, and the 12 Step and SoftStep foot controllers. Musicians can also look forward to the new QuNexus smart sensor keyboard controller with pressure and tilt per key and 16-bit control voltages (CV) in and out, recently on show at NAMM, which is expected to reach the UK in the next couple of months. MSL Professional adds Keith McMillen Instruments to a brand portfolio that currently includes JoeCo, MixVibes, Sonoma Wire Works, Markbass, DV Mark and Mark Drum.